No doubt I’m learning impaired because your email invites me to join the TMA Community (where? ), follow you on twitter (dude, where be your twitter “follow me” link? ), and to subscribe to your RSS feed. Where, oh where, is your subscribe button? In the meanwhile, I’ll go click happy on your ads. You’re not as learning impaired as I am site design impaired. -The “TMA community” basically meant “participate in the discussion”, which I suppose is covered by “leave a comment”. -For the RSS feed, I’ll also make that easier to find, but for now if you go into your browser’s address bar, you’ll see the RSS icon (in Chrome) or an RSS badge (in Safari) for easy subscription. And, as always, thanks for the monetization. I’m sure you’ve been well-versed on the importance of ads from your experience with “Greek Tragedy”. Lies, Damned Lies and Statistics. I don’t think Apple really cares, let them talk all they want. I owned a Nokia for years and bought a few Apps but they never seemed to work right. Now I own a number of Apps for my iPod (Gen2, iOS 4) and I continually look around for new Apps. Most platforms it’s not worth buying Apps because they are not updated for new releases of the OS, the OS is not updated so we can’t use new Apps on year old devices. Even if I can find an App for my phone OS, will it support my screen, sound, other hardware?!? If I buy an App and lose my phone will I be able to use it with my next phone? These spruikers can say what they want but regular people don’t read tech press. They just go out and buy the phone they want, simple as that. In Apple’s March 2nd iOS 4.3 announcement they told the world that there were 65,000 apps for the iPad and 350,000 for the iPhone/iPod touch. Yet Distimo says there were 75K iPad apps back in January. There’s a post over on Roughly Drafted that covers the “quality” issue much more thoroughly (if you don’t yet read Dan Eran Dilger, I highly recommend him). In addition to fundamental mistakes made by these analyst/clowns, they truly are comparing Apples and oranges in terms of app quality. The most recent estimate I’ve heard put the count at 80,000 as of 4/16. 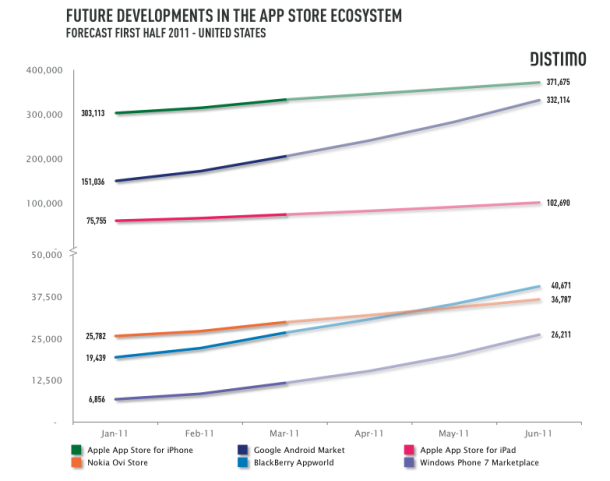 I don’t know if it’s due to an inability to count, or a different methodology, but to me it’s all the more reason to seriously discount anyone who says they know where an app store will be 3 months out – even if their charts do have that charming “infographic” feel.